This is one of the oldest jingles in my collection and, fittingly, it is also very much of its time. This one record says a lot about how air travel worked in the 1950s, how it was advertised, and what those advertisements sounded like. Because this was no ordinary record. It was a “make your own radio commercial” construction kit. But this first track is only an example. The other three have no narration;1 just an instrumental bed between the two sung portions. In jingle terminology, this is called a “donut.” It’s a part of the jingle when the singers drop out to leave room for a voiceover. 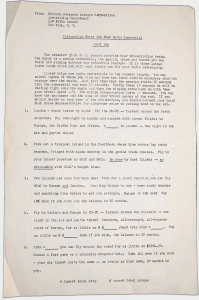 The record was accompanied by a script. 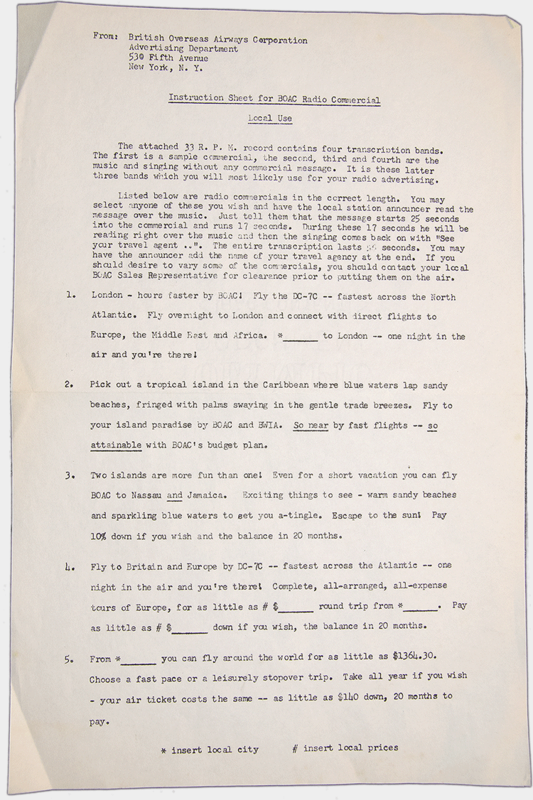 Travel agents would make small changes to the script (adding the name of their local airport, using local prices, and tacking the agency’s name on to the end) and then deliver it and the record to their local radio station. The station would either record the localized spot or read it live on the air. You can try this out for yourself! Click on the image of the script to the right to expand it, then play the music and read one of the scripts in your best 1950s announcer voice. There were many advantages to this arrangement. Keep in mind that in the 1950s the vast majority of tickets on commercial airline flights were sold through travel agents. BOAC had ticket offices of their own in some of the largest U.S. cities, but they depended on travel agents for most of their business. On the other hand, travel agents on their own didn’t have the resources to create musical radio commercials. With this record, the production is taken care of. All the travel agent has to do is pay for the media — and there may have been some sort of co-op arrangement in which BOAC chipped in for that, too. It’s also interesting to note that all five of the scripts are aimed squarely at affluent leisure travellers. In the 1950s, they represented the most important and lucrative market; today, of course, it’s business travellers airlines mostly target. This jingle is also a product of a time when pretty much all jingles sounded exactly the same: jazzy, cheerful, relentlessly upbeat. As Timothy Taylor points out in The Sounds of Capitalism,2 today, music in advertising is used to set a certain mood. But that attitude toward music didn’t really develop until the 1960s. In the Fifties, jingles were used more for their memorability than their ability to convey emotion. Like the relationship between airlines and travel agents, and the equipment used for transatlantic flights, that was about to change. You’re really flying when you fly B-O-A-C! World leader in air travel. Really flying when you fly B-O-A-C! No matter when or where you travel. Or fly to the south for a rest. See your travel agent as soon as you can. Any flight can be yours on the ten/twenty plan! You’re really flying when you fly B-O-A-C. I grew up in Canada. In the early 1970s I remember a radio advertising jingle that went something like “BOAC, is a Britain in the Sky.” Does anyone have any further information on it? Seems like that campaign only ran in Canada, which means it might be hard to track down. I did find some mentions of a BOAC jingle written by Bob Hahn, a Canadian jingle writer: ( http://www.thecanadianencyclopedia.ca/en/article/bob-hahn-emc ). Might have been him, but I don’t know if it’s the same jingle. It seems the History of Advertising Trust has a copy of the commercial ( http://www.hatads.org.uk/catalogue/record/dc575ca6-3a24-47fd-b66a-7925f29db638/ ) so next time you’re in Norwich you can check it out!